NOW THAT WINTER is upon us our feathered friends need a little help to see them safely through the winter period. A bit of extra attention from their owners and some adjustment to their normal diet will help them through the worst of conditions. It used to be that you could feed certain breakfast cereals to your hens during the coldest months but it is now against DEFRA regulations to feed anything which has been prepared in a domestic kitchen and/or for consumption by humans. Now, a small amount of wheat or maize grits (aka groats) offered on its own or added to their afternoon/evening feed, will promote inner body warmth to help them maintain body heat overnight. You could also make an alternative porridge by adding hot water to their mash and allowing it to cool. Be careful though as hens can’t taste ‘hot’ and it can be very easy to burn their mouth and digestive system. Keeping their water from freezing is a problem in itself. If you are home all day this entails frequent visits to remove the ice from their drinkers and replacing with fresh, cold water. However, if you can’t attend as regularly there are heating pads available that the drinkers can be placed on in order to keep them ice free. Some can be costly but as the saying goes “you get what you pay for”. But by far the biggest problem in winter is frostbite particularly if there is an icy wind as well. Their combs are very vulnerable to frostbite so a little extra time smearing their combs with a barrier cream will prevent the tips from turning black or even breaking off. Likewise frost can affect their feet, as can cracked or broken ice. It isn’t advisable to put any sort of barrier cream on their feet as this will encourage all manner of things to stick to them. 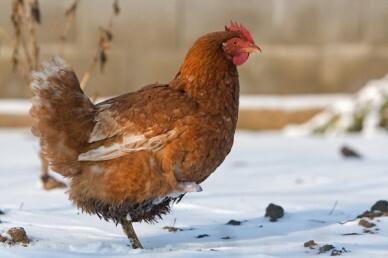 If your chickens are adventurous enough to go out into an open run it’s best to spread some straw, sand or earth around as covering the frozen ground will prevent their feet from cuts, burns or torn skin caused by their feet sticking to the frost or ice patches. Houses should be draught proof and fully weatherproofed but be careful not to block any ventilation as air still needs to circulate to keep your hens healthy and the coop fresh. Always ensure there is a covered, sheltered area where they can congregate if they venture outside. They should also have access to their coop at all times during winter but don’t leave food or water inside as this is an open invitation to rats, weasels or other small predators. Never put down any form of salt to clear snow or ice. This will definitely cause severe burns to the underside of their feet or any part of their body should they fall onto it or roll in it. They may even try pecking at it, particularly if it’s rock salt, as it can look remarkably like grit and this will not only burn their mouths, it could kill them if ingested. At night, increase the amount of bedding you use – if they find it too warm they will push it out of the way. If they perch at nights, they will do so top to tail i.e. one facing one way, the next one facing the other. This is another method by which they keep one another warm, in fact many’s the morning when a coop has been opened to let chickens out and the owners have been met with a blast of warm air from inside! You may have seen woolly jumpers available for chickens but there is no need to dress them up, even on the coldest days. By artificially insulating your hens you can end up doing more harm than good as more chickens are lost to overheating problems than to the effects of cold weather. Finally, egg production can go down in winter. Hybrids may continue laying but pure breed hens often go off lay completely during winter. This is quite normal. Following these few simple rules should keep your chickens healthy and comfortable throughout the winter. Just remember that they can stand the cold and they can tolerate the wet they just can’t cope with them both at the same time.